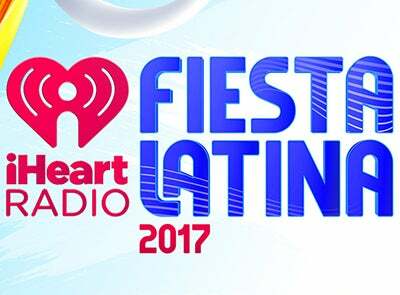 New York, NY – October 25, 2017 – iHeartMedia announced today that Ricky Martin, Luis Fonsi and Diplo will join Gente De Zona, Don Omar, CNCO, Reik, Jesse y Joy, Camila Cabello and Pepe Aguilar for the 2017 iHeartRadio Fiesta Latina: Celebrating Our Heroes, hosted by Enrique Santos and Telemundo’s Jessica Carillo on Saturday, November 4 at AmericanAirlines Arena. Telemundo will air the event LIVE as a four-hour television special at 8pm ET which will include special tributes to first responders and communities impacted by natural disasters. iHeartMedia will also broadcast the event LIVE nationwide across its Spanish-Pop, Tropical, regional Mexican and Spanish Adult Hit radio stations and livestream on iHeartRadio’s Official YouTube. In addition to bringing the biggest Latin artists to one stage, iHeartRadio Fiesta Latina will feature stories of the first responders who served their local communities during last month’s catastrophic natural disasters in Florida, Texas, Puerto Rico, Mexico and the Caribbean, and celebrate their resilience. The event will also provide information on how guests and listeners can support the local communities directly impacted by those events. This year, iHeartRadio and Enrique Santos will present Ricky Martin with the second annual iHeartRadio Premio Corazon Latino award. The award honors an individual that exemplifies their big heart through their selfless work in enhancing the lives, heritage and future of the Latin community. Through The Ricky Martin Foundation, Ricky Martin is receiving this award for his support following Hurricane Maria and his constant work throughout the years with human trafficking. Tickets are available now to the general public via iheartradio.com/fiesta. Proud partners of the 2017 iHeartRadio Fiesta Latina include Telemundo and AT&T, with more to be announced. The iHeartRadio Fiesta Latina is part of iHeartMedia's incredibly successful roster of major concert events, which includes the iHeartRadio Music Festival, the biggest live concert event in radio history, which features more than 20 A-list artists across every music genre on one stage; the iHeartSummer’17 Weekend by AT&T; the nationwide iHeartRadio Jingle Ball Concert Tour; iHeartRadio ALTer EGO; the iHeartCountry Festival; and the iHeartRadio Music Awards, which generated 165 billion social media impressions. Artists and/or events subject to change or cancellation without notice.